When the pleasant breezes of spring disappear, the sticky and practically stagnant heat of summer descends upon the south. It seems that no city, with the possible exception of Houston, experiences this seasonal change more than the northern capital of the Caribbean, New Orleans. Even in early April, the thermostat was nearing the 90s, which meant a quarter fest weekend full of seasonal fabrics and ice cold cocktails and beer. 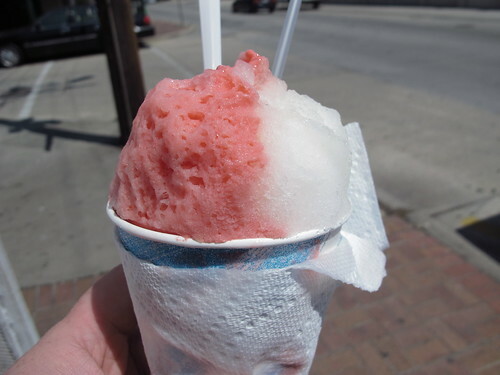 However, there are more kid friendly ways to beat the heat in New Orleans and one of the best is the snowball. To some, snowballs rank right up there with po-boys and beignets as must try attractions of the city. I’m specifically referring to the ideal day trip to New Orleans from the Serious Eats cookbook. In their whirlwind itinerary, the staff at Serious Eats decides that not one but two snowballs are necessary for the perfect day in Nola. The first name, Hansen’s Sno-Bliz, I know quite well, but I was unfamiliar with the second, Plum Street Snowballs. Curious to see why the writers at Serious Eats decided to include both vendors, I did a little comparison over a long weekend in Nola. First up was Hansen’s Sno-Bliz and even though I’m a latecomer to the party, I’ve done my best to proselytize the good word about Hansen’s shaved ice. My weapon of choice for combating the heat that Friday was a Satsuma and cream of nectar snowball. True to its name, the Satsuma in this snowball was tart but nicely balanced with the cream of nectar. Supposedly all the syrups at Hansen’s are homemade and with these intense flavors it showed, but the real star was the shaved ice. 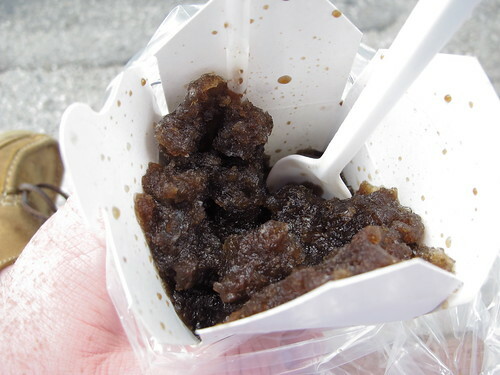 I’ve never had such finely shaved ice in a snowball/snowcone and through a combination of syrup application and ice texture; every bite was full of syrup flavor. Amazingly there wasn’t a pool of syrup at the bottom of my cup; the ice had sucked up every drop. 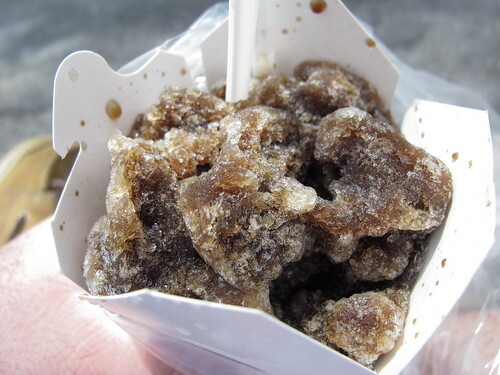 The next day after poking around the Farmer’s market and a po-boy or two, I drove to Plum Street to take a look at what Plum Street Snoballs had to offer. 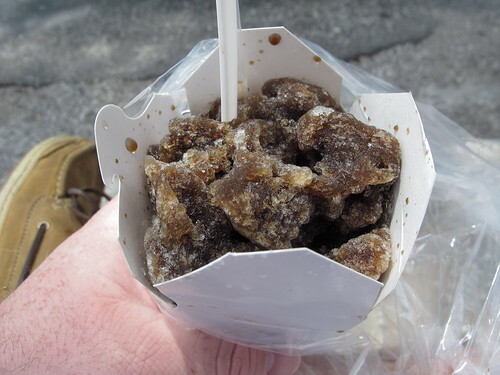 Owned and operated by Claude and Donna Black since 1975, Plum Street Snoballs has one immediately noticeable distinguishing factor, the Chinese food pails. According to an SFA interview, Plum Street also makes their syrups so I decided to try their products with a root beer snowball. Right off the bat, there was a significant departure from Hansen’s feather light ice. This ice was chunkier and the syrup quickly pooled at the bottom of the pail. Flavor wise, the root beer didn’t disappoint as an earthy tartness quickly developed into a fully sweet tail. Sadly, this snowball ended with a cup full of syrup and a little slush. 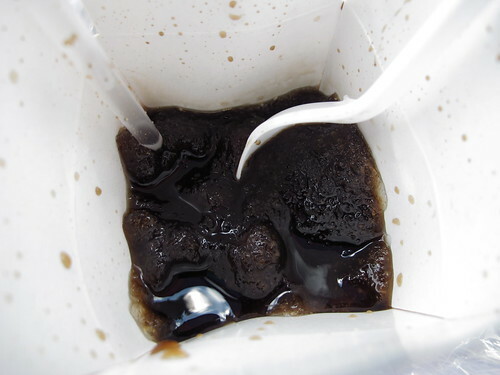 I was initially surprised when I was handed a food pail wrapped in a plastic bag, but with so much residual syrup, I was glad to escape with relatively clean hands. Between the two snowball outlets, it’s hard to go wrong. Going on flavors and potentially novelty, I can understand why Serious Eats would list both Hansen’s and Plum Street in their ideal Nola trip. There isn’t a bad choice to be made. But when it comes down to brass tacks, there’s no question in my mind, Hansen’s is the superior snowball. Chalk it up to the flavors or to the sublime texture of the ice, but a Hansen’s snowball is one of the few reasons I look forward to warmer weather.